Parkinsonism is a constellation of symptoms, including rigidity (stiffness), bradykinesia (paucity of spontaneous movement), loss of postural reflexes (prone to getting off balance and falling easily). It occurs in several different disease states, and can also be a side effect of certain medications (mostly used for prevention of nausea and for anti-psychotic uses). Parkinson Disease is the most common illness in which Parkinsonism is seen. Tremor is also a common symptom of Parkinson Disease, although it is much less common in other diseases which cause Parkinsonism. The tremor is often the first symptom noticed by the patient, and occurs most frequently in the hands and arms, but occasionally in the jaw. The head itself rarely participates in the tremor. The Parkinson tremor is a resting tremor, meaning it is worse when the limb is at rest and improves when the limb is used for a task. Parkinson Disease is a progressive degenerative disease of the brain. There is no cure at this time, but there are some very effective medical and surgical treatments. The links below contain much useful information about Parkinson Disease. Other Parkinsonian Syndromes include Progressive Supranuclear Palsy (PSP), and Multiple System Atrophy (MSA). Links are given below to these also. 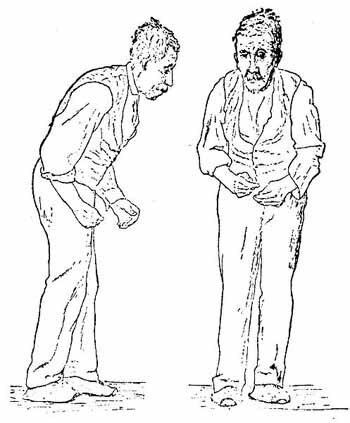 The drawing at left shows the typical gait posture of a Parkinsonian patient, from the classic 1886 Neurology text of Sir William Gowers. Essential Tremor is different than Parkinson's Disease. It is a slowly progressive disorder where the tremor occurs while the patient is using the limbs, not when they are resting (like in Parkinson's). The handwriting is often the first thing to show the effects of the tremor. The head and voice can also be involved in the tremor, which they are not in Parkinson's Disease. The tremor gets worse when the patient is experiencing stress or emotions. This tremor is hereditary. Usually a parent or sibling will also have the tremor. It is very common, with up to 5% of people over 40 having the disease. It is usually not seriously disabling, but there are exceptions. We have looked at these books and recommend them as useful sources of information. Links are included to the Amazon website where they also can often be obtained used at a very nominal price. Parkinson's Disease: A Complete Guide for Patients and Families, by William Weiner, MD, Lisa M. Shulman, MD, and Anthony E. Lang, MD. Parkinson's Disease For Dummies , by Michele Tagliati, MD, Gary N. Guten, MD, and Jo Horne. Parkinson's Disease and the Family, by Nutan Sharma, MD and Elaine Richman, PhD.